This was the penumtimate week of the summer IOP which saw the London Olympics draw to a close, but more importantly (!) saw the Clearflo project being reported on the BBC news. Many thanks to all who contributed. This week saw some fine summer weather but also occasional showery spots. 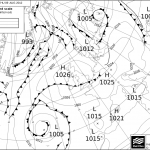 Monday the 6th started with the tail end of an occluded front moving away Northeastwards from England. In London the morning was fine with bright spells which lasted through most of the day. Tuesday the 7th saw another bright morning until a second occluded front brought a covering of cloud from the west with some showery outbreaks of rain around London. Conditions remained muggyy with light winds and a maximum temperature of 20 C.
A curious feature was observed at the BT tower weather station on these 2 days, first at 4am on the 6th and then from 8 to 10pm on the 7th – there was an unusually rapid and large increase in CO2 concentration being observed aloft, which coincided with a dip in observed water concentration. Whether this could be a signal of a plume of pollution or simply an instrumental error remains to be seen. Wednesday saw more steady levels of CO2 at the BT tower as conditions became drier and clearer again with more sunny intervals developing over London. Though elsewhere in southern English counties there was morning drizzle and light rain clearing to the east. However the humdity remained with increasing warming, maxing out at 23 C. This was followed by a night with little to no wind (even at the elevated BT tower the winds were very calm and settled) and widespread misty patches around London until dawn, dropping to 15 C in rural areas. This mist lingered in some coastal areas into Thursday morning but cleared rapidly in London after sunrise. By Thursday the 9th high pressure conditions were pushing their way over almost all of the UK once more (see figure below), which brought widespread sea fog to the south coasts and warm, dry conditions inland. Temperatures peaked at around 27 C in London by 2pm, dropping to 13 C at night under clear skies. These fine conditions persisted mostly in Friday, but by Saturday the temperatures had dropped with higher humidities and more blustery easterly winds pushing in towards London. One of the more interesting features of this past week is that even during the warm, clear, settled conditions of Thursday and Friday, the Met Office Daily Air quality Index was forecast to remain at low levels and barely changing throughout the week. The forecast for the final week of the summer IOP is looking highly changable, wet and warm. There’s likely to be significant cloud cover, humidity and rain showers early in the week with the current possibility of a summer thunderstorm early on Wednesday the 15th and some gusty southerly winds, so keep an eye out for that.